McLemore is a centrally-positioned hub to over 40,000 acres of conserved and protected wilderness area. Surrounding McLemore are unique natural resources, as well as historical and archaeological sites, offering activities for all levels of interest and physical abilities. For two years in a row, the readers of Outside Magazine voted Chattanooga and the area surrounding McLemore as the best town to live in the United States. Browse through some of the destinations and activities in the area to discover why so many people are falling in love with this unique place in the mountains. Over 20,000 acres of land surrounding McLemore are protected wilderness areas and parks. From Pigeon Mountain to Cloudland Canyon, our parks provide an outdoor adventure for fun and exploration. The Pocket at Pigeon Mountain in Walker County, Georgia is considered to be among the finest areas for wildflowers in Georgia. It is a part of the Crockford-Pigeon Mountain Wildlife Management Area, and is home to the Shirley Miller Wildflower Trail. 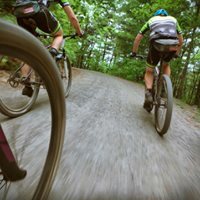 We invite you to enjoy the hundreds of miles of trails that twist through the mountains of Northwest Georgia. Whether you enjoy traveling by foot, bike or horse, your time spent on the trails around McLemore will be filled with memories. The area around McLemore has no shortage of breathtaking views that are easy to enjoy. The McLemore site itself offers several breathtaking scenic overlooks to enjoy, but there are a few more that provide fantastic views. National recognized for its outcroppings of sandstone and limestone, the McLemore area offers thousands of vertical feet of rock climbing and bouldering for the beginner to the seasoned enthusiast. The land surround McLemore is sprinkled with beautiful waterfalls meant for swimming beneath or simply admiring from a safe distance. From our very own Singing Sisters Falls to the majestic Cloudland Canyon Falls, the waterfalls of northwest Georgia are one of our state's greatest treasures. Whether by car, bike or Hog, riding the roads through McLemore Cove is a beautiful way to spend the afternoon or the weekend. Take a drive, watch the leaves turn colors or the sun set over Lookout Mountain. For the adventure-minded, the McLemore area is filled with incredible limestone caves. Among these is Ellison’s Cave, which features the deepest known cave pit in the continental United States, dropping 586 feet straight down. Click the map and discover the world of McLemore.